A couple of weeks ago I headed over to Belgium as part of my ongoing TechCrunch Euro Tour, to get a taste of the local web/mobile entrepreneur community just in time for Father’s Day (BTW, come to the London and Helsinki events soon). 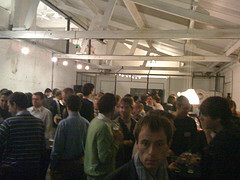 I hooked-up with another TechCrunch writer, Robin Wauters, and organiser of the Plugg conference, who had kindly arranged a TechCrunch Belgium meetup in Gent. Gent is quickly becoming one of the main places to startup in that country, as it’s a short drive from Brussels (which has the main airport and the excellent Eurostar), but Gent is cheaper, somewhat prettier and is a big university city with lots more potential talent to draw from. The startups each pitched their wares and here’s what I found. [Apologies for the delay in posting this, I’ve been visiting tech companies in China, of which, more later]. Thanks to Bart Claeys for the photos, below. With the quintessential Web 2.0 “r” in their domain, these guys are attempting to build the “largest database of events going on in Europe”. Their point is simple: Eventbrite have ticketing but no content. Eventful has content but not ticketing. Happenr combines both and is focused on European events. It will therefore compete with Amiando in Europe. An iPhone app is on the way and they have seeded the engine with lots of events organisers. It ended up getting some traction on TechCrunch. But clearly work is needed on the database if this is to be truly Pan-European. A search for events in Birmingham, considered to be the UK’s second city after London, turned up results listed as being in Edinburgh and some that didn’t mention Birmingham at all. However, I can see a need for an engine like this – especially one that can track the myriad number tech events across Europe. (Disclosure: One of our writers, Robin Wauters, is an investor and acting as head of marketing in his limited spare time). [Crunchbase]. Radionomy allows users to set up an online radio station. It features pre-programmed music shows, libraries, the ability to upload your own music library (apparently they will be paying licenses for all this music, even the stuff users upload). Aiming for 200,000 stations and EUR63m in revenues – quite a tall order as right now they have about 1,000 stations and are aiming for 4,000 by the end of this year. This sounds like an attempt to create reach across a long tail of user generated radio stations and monetise accordingly. Radionomy shares revenues with their DJs based on audience. It sells 4 mins of advertising per hour compared to 18mins for commercial raido. They wan to create the Long Tail of radio. They have about a million euros in funding. However they have “20,000 on the waiting list” which rather puzzled me. If this is Web 2.0, why should there be a “waiting list” at all? [Crunchbase].